Following convention these flowers are shown with the pedicel at the bottom of the photograph, but remember that these flowers actually hang upside down on the plant. Note the elaborate appendages on the tips of the poricidal anthers. 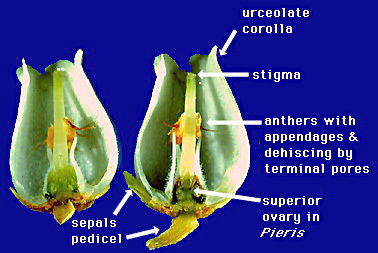 In Pieris, the ovary is superior. The fruit (not shown), as in most Ericaceae, is a capsule. Photo by K. R. Robertson and D. L. Nickrent from plants cultivated in Urbana, Illinois.